The 2018 Holiday Shopping Season is quickly approaching, and online retailers are already starting to advertise their Black Friday and Cyber Monday (BFCM) deals and sales through traditional and digital advertising channels. However, not many are advertising their deals on Facebook Messenger. Since Messenger Marketing is still a pretty new channel, it is considered a secondary priority for BFCM deals. This post will cover why Messenger is actually an amazing channel for BFCM. Historically, Black Friday has been huge for brick and mortar retail outlets, and Cyber Monday allowed the online retailers to catch the rest of the sales once everyone was back at their desks. While these individual days have now combined to form an entire BFCM weekend that has customers poised and ready to shop, Cyber Monday is still set to become the biggest online shopping day of the year. In 2017, the Monday following Thanksgiving was the biggest US online shopping day ever with sales topping $6.59 billion, according to Adobe Insights. These online purchases are no longer being made on a desktop computer. In fact, over half of the online retailer’s site visits were made on mobile devices last year, and that number is expected to climb again this year. In light of this reality, mobile advertising is becoming more important than ever. While potential customers are ready to shop, they are now discovering products and finalizing purchases through their mobile devices. Completing sales is going to rely on retailer’s ability to show customers the products they are ready to buy on their mobile device. With mobile advertising becoming an essential piece of an online retailer’s marketing strategy for BFCM weekend, they will also need to figure out the best way to get those potential customers to notice their ads. People are great at ignoring ads on their phone placed inside websites or apps. It just becomes background noise to the user eventually. However, they will take notice when they receive a new instant message, as it is typically something they want to interact with right away to respond to their friend or family member. Not only will potential customers notice the marketing through Facebook Messenger, but the platform is also quickly becoming a preferred method of communicating with brands and retailers. As more people use smart assistants to help them make purchases, they are no longer willing to browse through hundreds of products to find the right one. They want to be presented with exactly what they are looking to purchase and then complete that purchase quickly and easily. Messenger is a perfect platform to help them with both product discovery and purchasing. The platform feels more conversational than traditional advertising. For a potential customer it can seem like they are talking to a live person. If something goes wrong with their order, they feel like someone will be available to handle their issues. Over messenger, they can also feel like they are being given personal attention, even when they know it is an artificially intelligent bot. With BFCM quickly approaching, now is the time to finalize your Facebook Messenger marketing and put your strategy for the holiday season in place. We have a few ideas you can use when creating your plan. 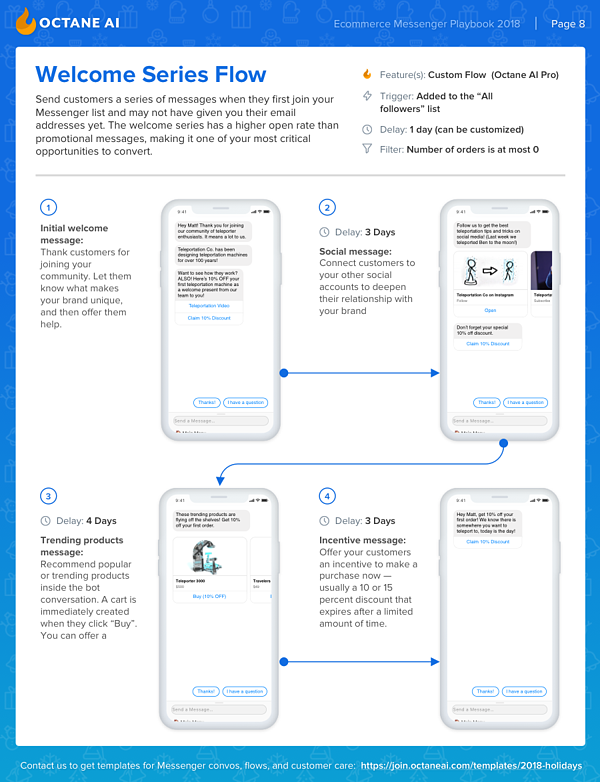 As a part of our 2018 Ecommerce Holiday Messenger Playbook, here are 5 Messenger marketing campaigns to run for BFCM. The first time a customer visits your site or subscribes, they are actively looking for products that you can potentially offer. This is not the time to turn them off by showing them things that do not interest them or annoy them with obtrusive advertisements. Utilizing a welcome series in Messenger can be like employing a greeter at the entrance of your store. Welcome the person to your site and offer to the help them find exactly what they need. Don’t offer them a coupon or discount right away, save that carrot for later to close the deal. During BFCM everyone is looking for the absolute best deal they can find for products. Reward those who are already following you, or have subscribed to your brand, with an exclusive deal. When customers know that a deal is only for a limited time, or only for a specific group of people, they will feel more urgency to take advantage of the deal now. If they have been following you for a while, and know that you perpetually offer the same deal, they won’t be as eager to purchase now. A former customer is just a new customer waiting to happen, right? Messenger is a great way to re-engage with a former customer and allow them to quickly let you know why they haven’t continued using your products. If you can resolve the issues they had with your company, you may be able to win them back with just a few simple questions and offers. Abandoned carts are a perfect way to know exactly what your potential customer wanted to buy. 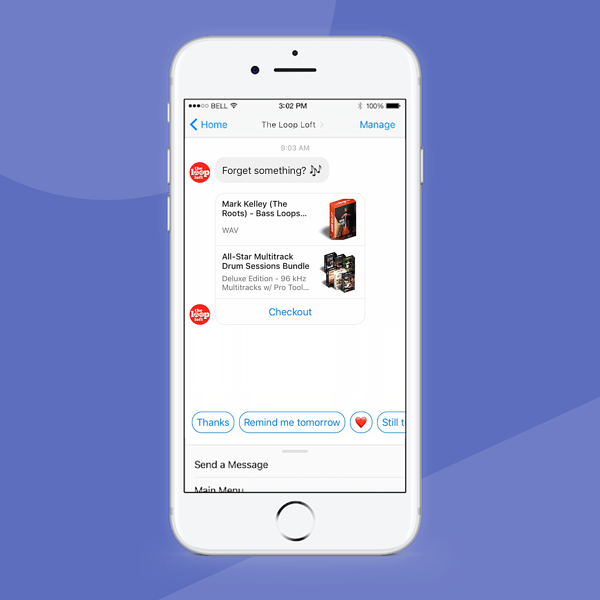 Sending them their cart through messenger, with a coupon code is a proven way to get them to finalize their purchase. This may be even more true during BFCM. Customers are usually willing to hold off on their purchases until BFCM weekend, just to see if any deals might come up to help them save money on something they were already planning to buy. Let them know you have their cart all ready to go for when they are ready to spend money during BFCM. While broadcasts are less personal than win-back campaigns and abandoned cart messages, they have still shown tremendous strength in helping customers interact with your brand. As we mentioned previously, a user is more likely to view your advertisement message if it is presented to them through Messenger. So broadcast messages will definitely be seen by more people than a traditional advertisement. Just make sure your message is quick and to the point. Nobody wants to read your company’s history in an instant message. Most people are already set to spend money during BFCM. You simply need to get your products or services in front of those who are looking for them. With Octane AI, you can create a BFCM marketing campaign that hits all of the suggestions listed above, easily. Need some ideas for BFCM 2018? Download our 2018 Ecommerce Holiday Messenger Playbook. 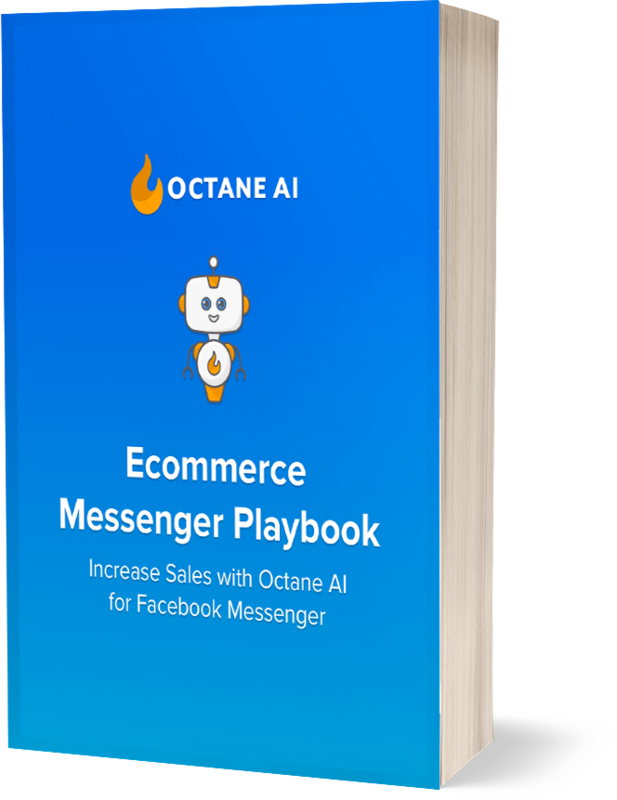 The Ecommerce Messenger Playbook is the definitive resource for merchants who want to acquire customers and increase revenue with Facebook Messenger flows, quizzes, and ads.